On Sunday, after 24 hard-fought hours, a checkered flag will wave and the winners of Le Mans — tired, battered and ecstatic — will ascend the podium. They’ll raise a trophy, and they’ll douse each other in champagne. That champagne shower is a long-held tradition in motorsport. And like every tradition, it was also once an invention. And like so many motorsport inventions, it’s one that belongs to American racing legend Dan Gurney. 1967 was a hell of a year for Dan Gurney. While the rest of America felt the strain of social change, aimed at the moon and protested Vietnam, Gurney found his speed. In February he set the fastest qualifying time at Daytona. In March it was a dominant showing at Brands Hatch in the prestigious Race of Champions. April saw a Trans-Am win in a Mercury Cougar, and by May Gurney and his Eagle had started both the Dutch Grand Prix and the Indy 500 from the front row. He was just getting warmed up. 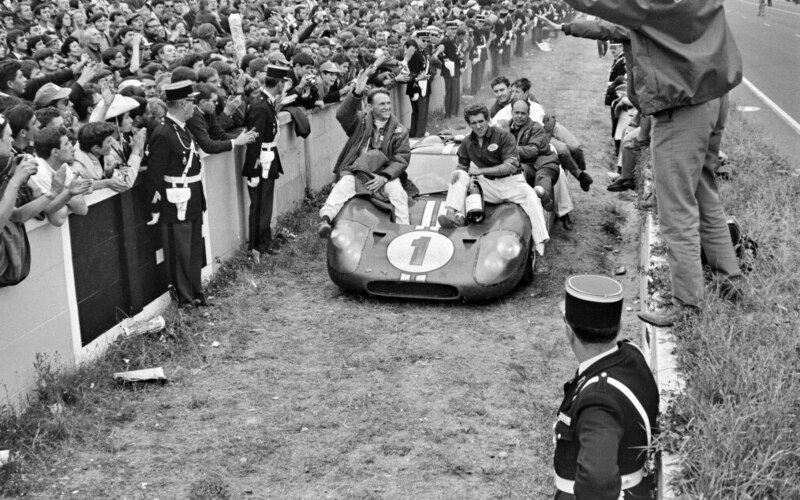 At Le Mans a month later, Gurney would challenge the race with the help of three American racing legends: AJ Foyt, Carroll Shelby and the Ford GT40. For the 1967 running of Le Mans, the MkIV Ford was truly an American effort, from the team to the tires. It was longer and prettier than its predecessors. It was safer, too, with a steel roll cage, and the car helmed by Gurney and Foyt was made more distinctive by the bulge in the roof made to accommodate Gurney’s height. Despite the all-star lineup, the team was entirely unproven and contesting a notoriously challenging circuit in a famously competitive era. Sceptics predicted the combination of strong personalities and Foyt’s inexperience at Le Mans would result in a disastrous finish. In the end, Gurney and Foyt made winning look easy. The Ford team stretched an early lead over the factory Ferrari to four laps by the end of the race. It was a drubbing. And it wasn’t just the factory Ferrari 330P4 of Ludovico Scarfiotti and Mike Parkes left in their wake. The list of drivers beat by Gurney and Foyt at Le Mans in 1967 is a who’s who of racing’s golden era: Elford, Andretti, McLaren, Siffert, Donohue, Ickx, Redman, Surtees, Rodríguez, Stommelen. It was a race win that would cement the team, and the car, in legend. 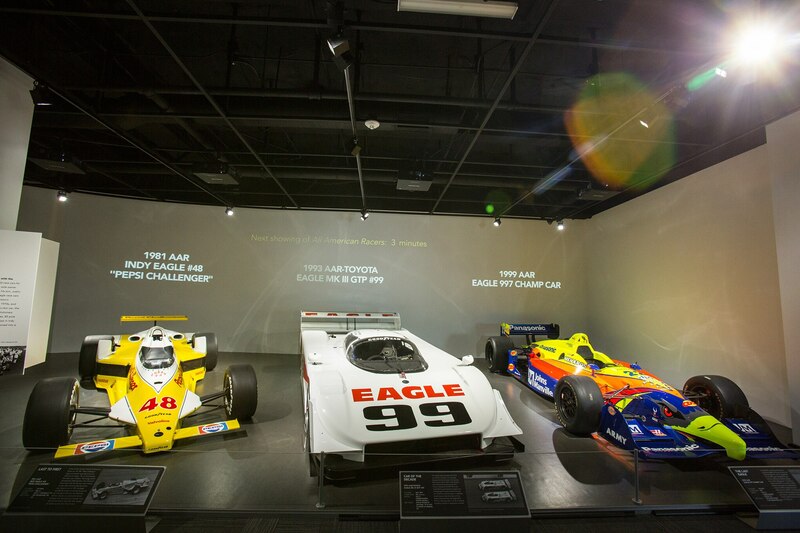 In a small gallery on the second floor of the Petersen museum in Los Angeles there’s a collection of Gurney’s cars. It’s a spectacular retrospective, a glimpse at the career of a man whose interests and successes were as broad as anyone in racing. There’s a Trans-Am Barracuda jostling for room with Eagle Indy cars. Gurney’s brilliant white Toyota GTP of the 90s is a stride or two away from the beautiful blue 1968 McLeagle CanAm car. And there’s a Grand Prix car too, the spectacular V-12 Gurney-Weslake that would carry Gurney to his second June 1967 victory at Spa. 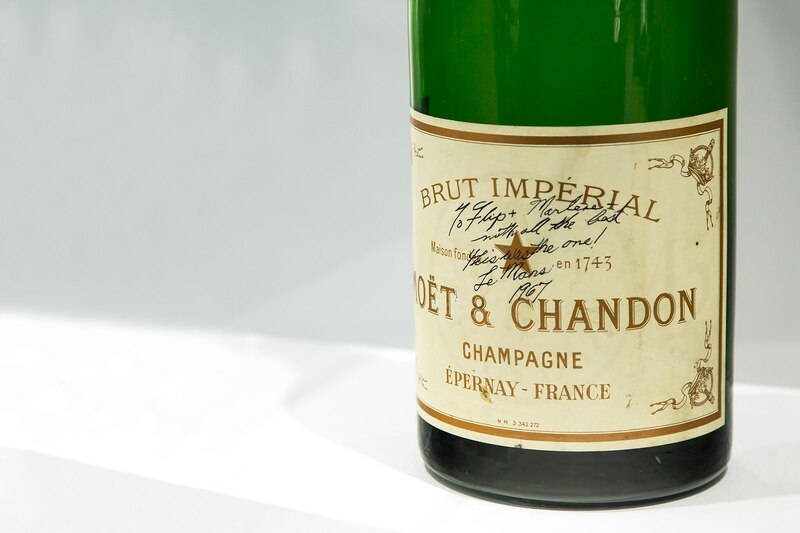 Amid all the historic cars it’s easy to breeze past a tidy display case carefully protecting an empty magnum of champagne, but if you pause for a moment you might realize that among all of Dan Gurney’s accomplishments and inventions, the tradition founded with this 50-year-old bottle of Moët might be the most lasting. Ever mischievous, when Gurney took to the podium at Le Mans in 1967, he accepted that very bottle of champagne and with an impromptu shake, unleashed it in a fountain on the crowd. It was an iconic moment, an expression of joy that made an indelible impression on a generation of racers — and one that has been copied thousands of times since. Miraculously, the bottle survived. 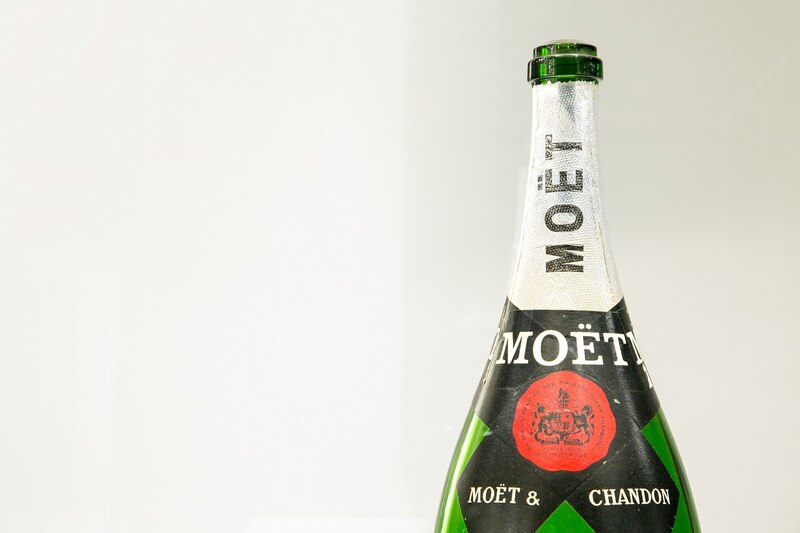 After hosing down the unsuspecting crowd (which included his wife, Shelby and Henry Ford II) Gurney signed and gave the big bottle of Moët to legendary Life photographer Flip Schulke. Appreciating the significance of the bottle, Schulke turned it into a lamp, and kept it in a place of honor at his home for decades before giving it back to Gurney before his death in 2008. 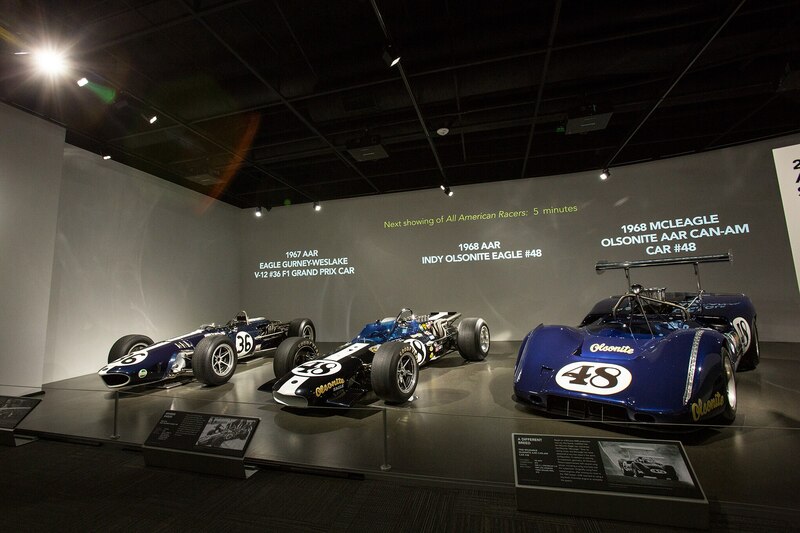 We credit Dan Gurney for dozens of innovations. He was a leader in aerodynamics, engineering and safety. He — and his cars — made an indelible impression on the sport. This weekend at Le Mans a fresh generation of racers will ascend the podium and uncork champagne in triumph. Almost inevitably, they’ll douse colleagues, photographers and friends. 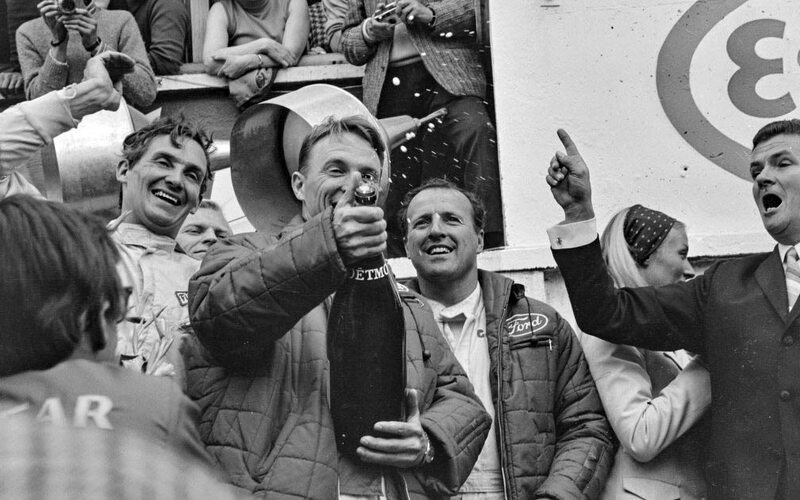 And while we’ll cheer their victory, we’ll also celebrate the popping of those champagne bottles as a salute to the man that invented the tradition at Le Mans 50 years ago — and raise a toast of our own.